The JFM programme faces existential crisis. On the one hand, pieces of legislation like the Forest Rights Act (FRA), 2006, and the Panchayat Extension to Scheduled Areas (PESA) Act, 1996, have come into existence, giving rights to tribals and forest dwellers over forest resources and their management. On the other hand, communities demand the huge sums forest departments owe them under the programme. Questions are being raised whether the programme should be scrapped. In January this year, one high-level committee and the politically influential National Advisory Council suggested drastic changes in the programme. The National Forest Rights Act Committee (NFRAC), constituted to review the implementation of FRA, recommended that wherever community forest rights are recognised under the Act, JFM committees be scraped. It said the powers and resources of JFM committees should be transferred to the committees of gram sabhas formed under FRA. Going one step further, NAC recommended that in all the forest villages the management of community forest resources be suo moto handed over to the gram sabha and the forest department should just act as a facilitator. This means downsizing JFM drastically. Ten dissenting members of the 20-member NFRAC even suggested scrapping of JFM and creating an alternative model on the line of the forest rights law in areas where community claims are declined. While these recommendations were being debated, the environment ministry threw its weight behind JFM. Many see this move as counter to FRA that has substantially reduced the department’s scope in forest villages. The Green India Mission to combat climate change suggests amendments in the Indian Forests Act and the panchayati raj Acts to give JFM committees the power of a forest officer. The mission document says these committees will be recognised as legal entities of gram sabhas. It also talks about strengthening the Forest Development Authorities. Former environment minister Jairam Ramesh had asked the states to place JFM committees under the control of gram sabhas. In a letter written to the chief ministers in October last year, he said these committees should be made standing committees of panchayats. The letter directed that the state panchayat laws and JFM guidelines be amended to ensure that these committees are recognised as organs of the gram sabhas. He reiterated this in another letter written to the states in March this year. The minister said these changes were required in the context of the decentralised governance envisaged by the 73rd Ammendment of the Constitution in 1993 and the PESA Act. Forest officials of all the states Down To Earth visited, except West Bengal, have rejected the minister’s proposal. Activists doubt government’s intentions. “Instead of changing the structure of these committees, the ministry wants them to be given the statutory and legal authority that gram sabha-based committees enjoy under the panchayat laws and FRA,” says Shankar Gopalakrishnan of non-profit Campaign for Survival and Dignity. “In the name of democratising JFM the ministry is trying to foist JFM committees on the gram sabha instead of allowing gram sabhas to exercise their legal powers which do not require joint management of any kind.” In the Green India Mission, all the Mission’s bodies above the village level are controlled by the forest department. “How is the gram sabha to manage anything if funds, policies and coordination are controlled by the forest department,” he asks. JFM has attracted officials’ interest only when it is funded sufficiently. In the 1970s and ’80s, social forestry programmes attracted the maximum support from foreign donors. In the 1990s, the JFM programme replaced them. Currently, 15 states implement JFM programmes with Rs 8,493 crore of foreign support. Many states are looking for donors for Rs 4,000-crore JFM projects. In the 1990s donors pumped in Rs 4,220 crore. The major funding agencies are JBIC, World Bank, OECF-Japan, DFID-UK, SIDA-Sweden, UNDP and Germany. JFM spread much faster in states that received external assistance. As per available data, in states that received assistance, such as Karnataka, Maharashtra, Madhya Pradesh, Rajasthan, Haryana, Himachal Pradesh, Andhra Pradesh and West Bengal, nearly 48 per cent of degraded forests have been afforested under JFM. 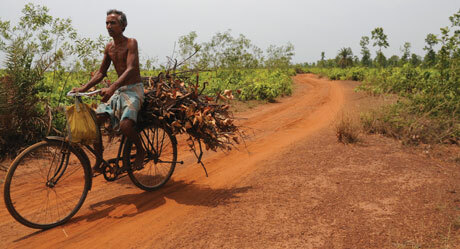 In states without funding only 16 per cent of degraded forests have been brought under JFM. Afforested area accounted for 17 per cent of the total forest area in states that sought assistance, while only seven per cent of the total forest area was afforested in states that did not receive assistance. When World Bank funding stopped most state forest departments lost interest in the programme. “Most JFM committees are defunct because of the scarcity of funds. A broad cross-section of village communities never got interested because JFM never offered substantial gains to the wider cross-section of the village, says Sharad Lele of Ashoka Trust for Research on Ecology and Environment. He says in some locations (Gujarat, Odisha) where people had already been protecting forests on their own, they thought JFM would strengthen their hands, but eventually found that they had been misled and have become disillusioned. FRA marks a change in the forest governance regime. Madhu Sarin of advocacy group Campaign for Survival and Dignity says, now that communities have a legal right to protect and manage forests, JFM committees are “both unnecessary and of questionable legality”. Advocating JFM, she says, will subvert community forest management. Agreed Chetan Agarwal, “FRA should override JFM in areas where it is applicable and an improved form of JFM should be developed in the rest which should gradually be converted into community forest management.” He warns that the community forest rights provision of FRA is difficult to implement. “How these rights will be recorded in forest and revenue records has not been figured out yet in most states and the communities have to fight their way at each step,” says Agarwal. Besides, ownership of timber in community forest rights is implied rather than being clear-cut under FRA, he adds.